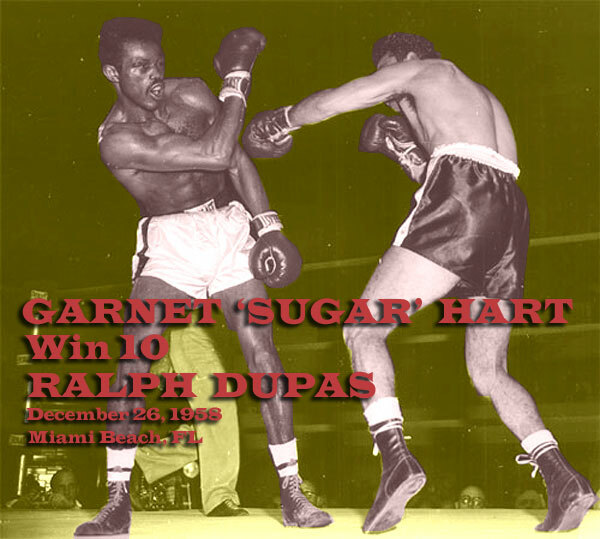 On this day in 1958, Garnet "Sugar" Hart beat tough and experienced Ralph Dupas (74-9-6) by 10-round split decision at the Miami Beach Auditorium to push his pro record to 26-3-2 (21 KO). He scored the win despite a bad cut over his right eye, impressing the judges with his sharp-punching style. The fight was a typical Sugar Hart thriller with much action & flash. With the victory, Hart held onto his #2 welterweight ranking and closed out a very good year of boxing for him. It was his first fight since a controversial 10-round draw against Gil Turner at Connie Mack Stadium in Philadelphia six months before. Most observers felt Hart beat Turner, despite the official score. Hart would move onto to 1959 and win two bouts (including one against Isaac Logart) before waging the most memorable war of his career in October vs. Charley Scott.